A Campbeltown football coach netted a top award at Glasgow’s Sports Person of the Year Awards. Stuart Crossan, whose parents live in High Street, works with Pollok United Soccer Academy. 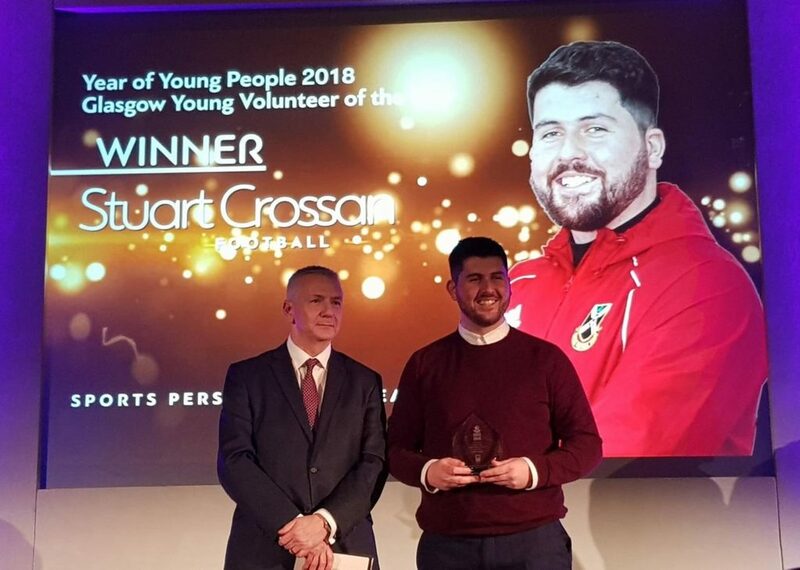 Mr Crossan recently collected the Evening Times Glasgow Volunteer of the Year 2018 award. Mr Crossan said: ‘I was delighted to represent the Pollok United Soccer Academy and all the coaches and officials and I’m really proud of the work that everyone does at the academy. ‘I’m lucky in that since I can remember football has been a massive part of my life. ‘That is due to the volunteers and coaches growing up giving so much time and effort to ensure that we were able to get the same opportunities as others. ‘The amount of incredible memories that we all have of different festivals and bus journeys is testament to the efforts of everyone involved. ‘I joined the academy and did not expect much from it. ‘I had done so much coaching/volunteering at the time through college and thought this would be another few weeks of something and that would be that. ‘Luckily I was joining an academy which had Andy Elliott as chairman. ‘Andy is an unbelievable person but even better than that he is surrounded by amazing people. ‘Andy and Allan Robb, now club chairman, have been fantastic for myself. ‘They have given me opportunities through the academy to develop myself further as a coach. ‘Most recently supporting me on my UEFA B Licence which I passed in November. ‘The past four years have been amazing and I’m looking forward to the next four and the opportunities that will hopefully come for everyone involved at the academy. ‘I want to thank everyone who has been in touch to congratulate me, especially my Mum and Dad. ‘Despite them having some sort of special powers to still annoy me daily, even though we are 140 miles apart, they support me in everything. Every summer Mr Crossan brings the boys he coaches to Kintyre to soak up the sun at Westport beach. Last summer at Campbeltown Tennis Club they showed members footballing is not their only ace skill.